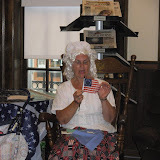 Serving the Information, Entertainment and Educational Needs of Boscobel and Our Surrounding Communities Since 1916. Search for and order books here:Library Catalog or click Catalog Help above. Facebook: Boscobel Public Library Twitter: BoscoLibrary . Confused by all the hype around the 2018 Midterm General Election? First-time voter? Want to check your voter registration or request an absentee ballot? On this page, you will find the tools you need to make an informed decision, as well as information about how to register, voter ID requirements and how to locate your polling place. Don't forget to also visit our voter's resource bookshelf in the library! Make your voice heard, vote! What is the Mid-term Election and Why is it Important? Voter ID Information: acceptable ID , how to obtain Wisconsin voter ID and what to do if you are missing original identification documents, like a birth certificate. We value your comments about our library programs, services, blog and plans. All comments are moderated, please be considerate. Thanks! Boscobel's 1925 Claude & Starck designed Carnegie Library. LIBRARY HOURS: Mon & Wed, 10 am - 8 pm; Tue. & Thur., 1 pm- 8 pm; Fri. 10 am -5 pm; Sat 10 am - 1 pm. Squeaky Spike's "BE Creative" End of Summer Party! Boscobel Public Library Creative Commons. Ethereal theme. Theme images by sndr. Powered by Blogger.